Peter Hall has been an active participant in the local music scene playing clubs, coffee houses and other venues around the county. In the singer-songwriter tradition, he maintains both his solo-acoustic and electric ensemble careers. The best influences from Rock & Roll, Blues, Folk and Country Music have helped shape Peter's sound into one uniquely his own. His self-produced CD "Ataraxia" (1995) features nine original songs and one cover representing a variety of styles and arrangements. In live performance, he is able to draw on a large repertoire of original and cover songs. Peter's second CD "Uncluttered" (2002) is a 13 song project recorded with all acoustic instruments. There are eleven originals and two covers spanning influences from Bluegrass to Rock. His third album "Schwagtown" (2009) contains a variety of styles including Rock and Roll originals, Blues standard and acoustic based songs. "Schwagtown" is his most ambitious project to date and Peter has high hopes for its success. Peter has appeared on both television and radio in San Diego. His musical career continues to climb to new heights. He has shared the stage with some of Southern California's best talent and maintains a high threshold of songwriting quality. 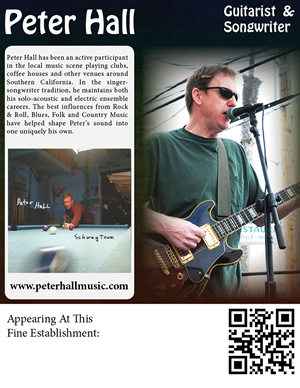 In 2011, Peter was a San Diego Music Award nominee for Best Acoustic.